Urea is the principal disposal form of amino groups of amino acids, and about 90% of nitrogen containing compounds of urine. At first, the amino groups of amino acids are converted into glutamate by the process of transamination reaction.Then, glutamate can enter into oxidative deamination reaction, and provide ammonia. Finally, most of the toxic ammonia is converted to urea by the process of urea cycle, and excreted through the urine. The first two reactions of cycle occur in mitochondria, whereas the remaining reactions occur in cytoplasm of cells. (1) Synthesis of carbamoyl phosphate: Carbamoyl phosphate is formed from ammonia by the action of mitochondrial carbamoyl phosphate synthetase I. This rate limiting enzyme of urea cycle is active only in the presence of N-acetylglutamate. Two molecules of ATP are required to form carbamoyl phosphate. (2) Formation of citrulline: The carbamoyl group of carbamoyl phosphate is transferred to ornithine, forming citrulline, catalyzed by ornithine transcarbamoylase. 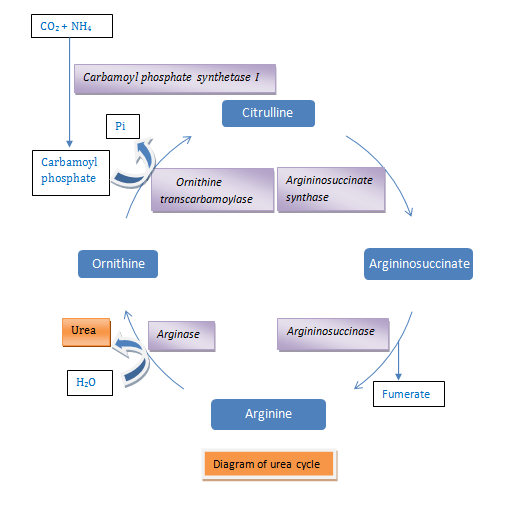 (3) Formation of argininosuccinate: Argininosuccinate synthase links citrulline and aspartate via amino group of aspartate, and form argininosuccinate. The amino group of aspartate provides second nitrogen of urea. This reaction requires ATP. (4) Cleavage of argininosuccinate: Argininosuccinase cleaves the argininosuccinate to arginine and fumarate. Arginine serves as the immediate precursor of urea. Fumarate is hydrated to malate, and subsequent oxidation of malate forms oxaloacetate. This oxaloacetate re-forms aspartate by the process of transamination. (5) Cleavage of arginine releases urea: Hydrolytic cleavage of arginine, catalyzed by liver arginase, relases urea and ornithine. This reaction occurs almost exclusively in yhe liver. Ornithine, reenters liver for additional rounds of urea synthesis. (6) Disposal of urea: From liver, urea is transported in blood to kidney, where it is filtered and excreted through the urine. A small portion of urea diffuses from blood into the intestine, and is converted to carbon dioxide (CO2) and ammonia (NH3) by bacterial urease. This NH3 is partly excreted in the feces, and is partly reabsorbed into blood. The rate limiting enzyme of urea cycle is carbamoyl phosphate synthetase I, which is active only in the presence of N-acetylglutamate. N-acetylglutamate is produced from glutamate and acetyl CoA, in a reaction for which arginine is activator. Therefore, glutamate (substrate of N-acetylglutamate) and arginine (activator of N-acetylglutamate production) are increased after intake of protein rich diet, which ultimately increased the intrahepatic concentration of N-acetylglutamate. This leads to increased rate of urea production. Urea cycle disorder is comparatively rare, but medically devastating. This disorder is associated with genetic defects in each enzyme of urea cycle, of N-acetylglutamate synthetase, and of the membrane associated ornithine transporter. All defects of urea cycle lead to ammonia intoxication. Common clinical symptoms of urea cycle disorders include vomiting, irritability, lethargy, intermittent ataxia, and mental retardation. In persons with urea cycle disorder, high protein foods should be avoided, and a frequent small low protein meals should be intake to avoid sudden rises in blood ammonia levels.